With the fourth installment of the hit animated poker series The Micros set to debut on Friday, I thought it would be a good time to recap the previous three episodes of the series and take a look at where the plot lines are heading. 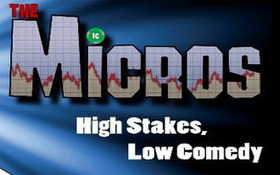 In Episode 1 we were introduced to our rag-tag group of micro-limit poker players –Chase “SwedeTooth” Berger, Tom Phuoc, and Rose “Balls” Ballenger, each with their own personality traits that have kept them playing in the smallest stakes games available; that was until one of the three, SwedeTooth, decided to play in the Mega Millions tournament –which he would win on a 1-outer on the river, giving him and his compatriots equal shares of the $1.2 million in prize-money. In Episode 2 we pick up with our heroes as they try to plot their next move in the poker, only to see Rose sneak off to the bathroom and tilt off a couple hundred thousand dollars in a matter of minutes. This leads to the trio heading to Australia to take part in the Aussie Millions… and do something about Rose’s “problem”. In Episode we find Rose in a mental hospital for problem gamblers, and SwedeTooth busting out of the Aussie Million in a matter of minutes. Wallowing away their time in a local bar SwedeTooth meets, and ends up challenging, his poker idol to a “Heads-Up for Rollz” match. While at the same time Rose is seen escaping from the hospital. This entry was posted on Thursday, March 31st, 2011 at 8:02 pm and is filed under Poker News. You can follow any responses to this entry through the RSS 2.0 feed. You can leave a response, or trackback from your own site.